After every fresh horror reported in Israel-Palestine, observers note that the two-state solution is in jeopardy. Yet following the latest massacre, of at least 60 civilian protesters from Gaza at the hands of Israeli forces, and after years of increasing misery in the densely populated coastal strip as Israel maintains its siege, it is not just the two-state solution that seems implausible; it is any solution. On May 14th, the Trump administration formally relocated the US embassy in Israel from Tel Aviv to Jerusalem, a dangerous decision earlier overwhelmingly condemned by a majority of the United Nations General Assembly (128-9) and all 28 EU foreign ministers. During its first 14 months in office, the Trump administration’s foreign policy agenda has been driven not by a clear ideology or national interest, but a determination to do the opposite of whatever President Obama did during his tenure in office: witness its decisions to withdraw from the JCPOA and the Paris Climate Agreement. With the relocation of the embassy, the White House took another alarming Middle East policy decision while flat out ignoring the pleas of the international community to rethink. On the day the President’s daughter, Ivanka Trump—who holds no elected office—along with a handful of US officials attended the new US embassy’s opening ceremony, Israeli snipers gunned down unarmed demonstrators at the Gaza border fence. This tragedy came a little over a month after the Passover Massacre, when Israeli soldiers opened fire, killing 17 and wounding more than 1000 Palestinians. Let’s be honest, the Israeli-Palestinian conflict is a complex, emotionally charged issue that divides people like no other. Need proof? Just check out the debates on university campuses about the BDS movement. In such a climate, it is easy to get stuck in one’s own ideological, emotional bubble. How can we move beyond this? We can begin by abandoning what is now a tired dogma, that the end goal of the so-called ‘peace process’ is necessarily the two-state solution. As hurtful as this may be for some to hear, a close inspection of the current map of Israel makes that quite clear: mushrooming Israeli settlements in the West Bank and East Jerusalem, illegal under international law but built with impunity; the Palestinians’ demand for the right to return of refugees and their descendants to their ancestral towns and villages, rather than to be confined in 22% of their original homeland; and the Israeli refusal—now supported by the Trump administration—to share Jerusalem as the capital of two separate states. If the possibility for peace there still is, we must consider the option of a single state where Palestinians enjoy the same equal rights and opportunities Israelis now do. The undertaking is enormous, for it must overcome seven decades of mutual distrust, resentment, and fear. Work towards a lasting peace, then, should focus on reconciliation and coexistence inside one territory. Easy enough to say, but coming on the heels of the massacre, almost impossible to imagine. Yet if the UN, the EU, Russia, China and Canada at least indicate this option could be on the table if Palestinians want it, movement again becomes possible. 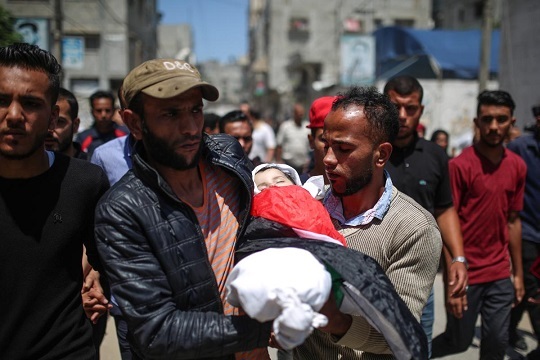 Hamas, in government in the Gaza Strip and organiser of the protests, was no doubt aware of the likelihood of a fierce Israeli response, and therefore of significant civilian deaths. Yet there should be no denying that Israel’s response, now as before, is disproportionate—massively so. States have the right and responsibility to defend their territories and peoples, but this must be done according to international law and the principle of proportionality. The international community has repeatedly called upon Israel to show restraint in its response to Palestinians (2010, 2014, 2018), but in vain. Logic says the prospects for ending one of the longest conflicts in modern history suffer gravely whenever random killing of unarmed protesters is not only tolerated but sanctioned. Even if Israel controls land from the Jordan to the Mediterranean, how can it ever experience a lasting peace when every few weeks new images of unarmed people killed by Israeli snipers are engraved into the consciousness of Palestinians and the rest of the world? This must stop.